The vehicles, which were handed over to the Pope by Nissan-Renault CEO Carlos Ghosn, were developed with French coach builder Gruau, Renault said. PARIS (Reuters) -- Pope Benedict will be able to limit his impact on the environment as he travels around his summer residence at Castel Gandolfo thanks to a new custom-made electric vehicle donated by French car maker Renault. The white vehicle has the Papal coat of arms on its doors, Renault said today. Based on the Kangoo Maxi van, it has a 44-kilowatt electric motor and lithium-ion battery, and can travel 106 miles without recharging. "It is an ecological, sustainable-development version of the Popemobile," Renault said. Renault also presented a second electric vehicle for use by the Vatican Corps of Gendarmerie for the Pope's security, similar to the first but with blue livery and a white and yellow stripe along each side. The vehicles, which were handed over to the Pope by Renault CEO Carlos Ghosn, were developed with French coach builder Gruau, Renault said. "This donation to His Holiness is a means for Renault to reaffirm its strong and durable commitment to sustainable development and respect for the environment," Renault CEO Carlos Ghosn said in a statement. Ghosn was raised in Lebanon in the Maronite Church and studied in a Jesuit school, according to various biographical accounts. Although the Maronite Church is an Eastern Catholic Church, it is loyal to the Church of Rome and to the Pope. The public is used to seeing the pope traveling in a white Popemobile, based on the Mercedes-Benz M-Class with bulletproof windows. The new Popemobile can go about 106 miles without a charge. 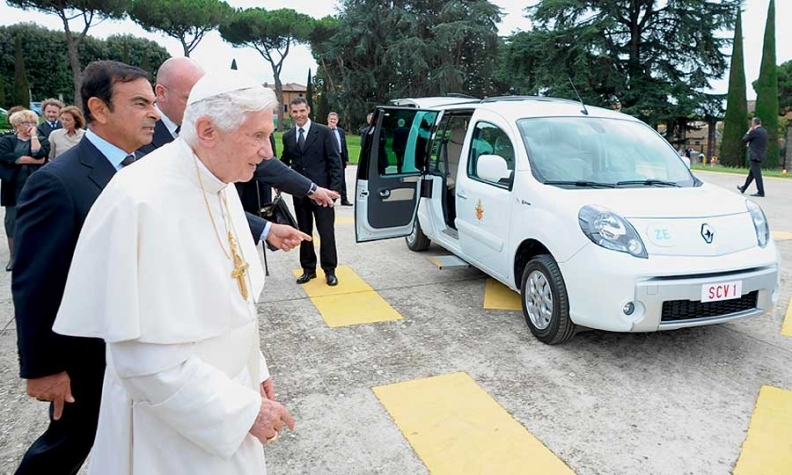 French carmaker Renault has presented His Holiness Benedict XVI with an electric vehicle designed and built especially to meet the Pope's mobility needs. The vehicle is based on Kangoo Maxi Z.E. and was developed in association with the French coachbuilder Gruau. Renault also donated a second electric vehicle to the Corps of Gendarmerie of Vatican City. These vehicles were presented to the Pope yesterday by the Renault Group's Chairman and Chief Executive Officer Carlos Ghosn at the Holy Father's summer residence in Castel Gandolfo. Renault has presented the Vatican with two electric vehicles made especially to meet the mobility needs of the Pope. The vehicles were handed over on Wednesday, September 5, to His Holiness Benedict XVI by Renault's Chairman and Chief Executive Officer Carlos Ghosn during a visit to the Pope's summer residence in Castel Gandolfo. The first vehicle, for use when the Pope is traveling at his summer residence, is white with the Papal coat of arms depicted on the doors. It is an ecological, sustainable-development version of the Popemobile. Based on Kangoo Maxi Z.E., it measures 4.6 metres in length and 1.8 metres in width. It is powered by a 44kW (60hp) electric motor and a lithium-ion battery which ensures an average NEDC combined-cycle range of 170km. The design of the other vehicle is very similar to that of the first, although its blue livery features a white and yellow stripe along each flank. It is for use by the Corps of Gendarmerie Corps of Vatican City for the Pope's security. 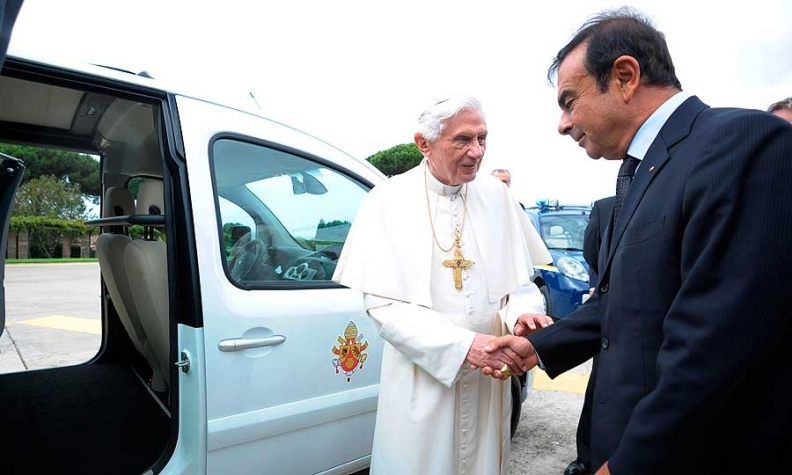 The two vehicles see Renault put its experience as automobile manufacturer and leader of the electric vehicle sector at the service of the sustainable development message of the Vatican and His Holiness Benedict XVI. Recognised as particularly attentive to environmental issues, the Pope has frequently underlined the need for sustainable development to safeguard Creation.